HY40OP is 1 3.5 cm length, 10 cm height which is compliance with Pci express 1.0 standard interface cards. The card has 4 slots. 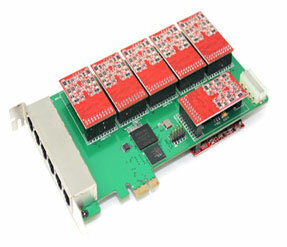 Every slot can be inserted with single FXO / FXS module which can be used to connect 1-4 analog telephone channels. Both of HY800A and HY1600A is 23 cm length(less than full card length), 10 cm high.They are compliance with PCI 2. 2 standard and can be installed on most PC because of its moderate length. Both cards have 8 slots. Every slot can ben inserted with single and dual FXO / FXS modules.So every card can be used to connect 1-16 channels.